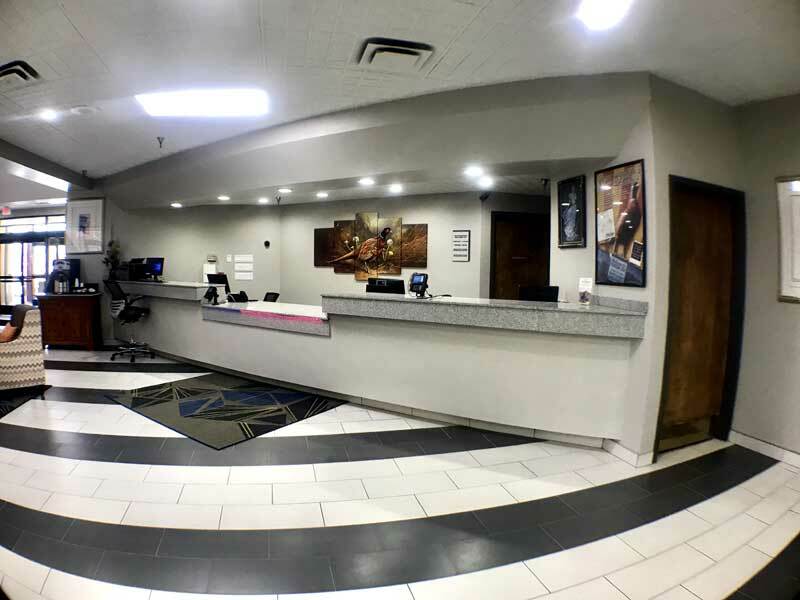 The Crossroads Hotel Huron and Event Center is the finest lodging Huron has to offer! All of our beautiful guest rooms have a variety of amenities. Take a refreshing dip in our Indoor Pool. Our beautiful rooms will have all the amenities you need for a comfortable stay. PLEASE EXCUSE our dust as we are Remodeling the Lobby ONLY. The Huron Event Center links the Crossroads Hotel with the Huron Arena and Exposition Center, providing over 23,000 square feet of meeting space and pre-function area for a grand total of 34,000 square feet. Beyond sheer space, you'll discover airtight technology to handle your heaviest audio/video presentation requirements. And when it comes time to entertain, you and your group can enjoy the area's most diverse, exquisite cuisine without ever having to step outside. Should you wish to venture out, recharge or just experience a taste of the town, the heart of downtown Huron is just beyond the Event Center's front door. Ryan's Hangar Restaurant & Ace Lounge is located at the Crossroads Hotel, and is the area's preeminent location for superior steaks, seafood, and pastas. The restaurant is open daily from 4pm to 10pm, and the lounge remains open until 11pm. Reservations are appreciated, and walk-ins are welcome. Activities : The community of Huron is rich with local talent and each year Huron welcomes various performers, bands and cultural programs to entertain residents and visitors. Read more about Arts & Culture in Huron. Attractions :Huron's 12,592 residents all agree—our community is a great place to live, work, play, and raise a family. We invite visitors to experience all of the wonderful events, entertainment, and recreational opportunities we enjoy so much. The Huron Chamber of Commerce is always ready to help you plan an event as well. Business :The Huron Event Center links the Crossroads Hotel with the Huron Arena and Exposition Center, providing over 23,000 square feet of meeting space and pre-function area for a grand total of 34,000 square feet.Beyond sheer space, you'll discover airtight technology to handle your heaviest audio/video presentation requirements. And when it comes time to entertain, you and your group can enjoy the area's most diverse, exquisite cuisine without ever having to step outside. Golf : Enjoy the unique golf experience at Broadland Creek National, Huron's finest and one of South Dakota's best public golf courses. The natural prairie setting, enhanced by Broadland Creek and some additional ponds, affords an opportunity to enjoy nature and golf the way it should be with relaxation, beauty, and excitement. Government : The Parks & Recreation Board will change from meeting twice a month to once a month on the 3rd Wednesday, and the meeting location will change from the Plains to the Campus Center located at 333 9th Street SW. Due to a scheduling conflict the September board meeting will be held on the 23rd. Questions may be directed to the Parks & Recreation Department at 353-8533. Hospitals :The mission of Huron Regional Medical Center is to work together with each individual and organization in the region to promote and improve community health. University : Registration is open until the first day of class. To take advantage of our general studies course rate of $40 per credit hour contact HCC at 353-8518 or email .The Huron Community Campus (HCC) will continue to emphasize its two largest, most popular programs with our Associates Degree in General Studies and our Nursing Programs. We have also made several other options available in order for students to accomplish their educational goals. Stay 2 get 3rd night FREE. Free night applies to least expensive night. Stay midweek and get a 15 % discount. 2 night minimum stay. Higher rates on weekends. Start your stay on Sunday and get a 20% discount. Midweek 15% and higher rates on weekends.